Solara Resort is your opportunity to own a piece of the Disney area magic. Single Family detached vacation homes and Townhomes in Solara will boast a multiple exterior options from Coastal, Mediterranean to Modern as well as upscale interiors. They are offering properties from 3 to 9 bedrooms and all come inclusive with a screened and heated pool with brick paver decking for you and your visitors. Solara Resort, a 24 hr. 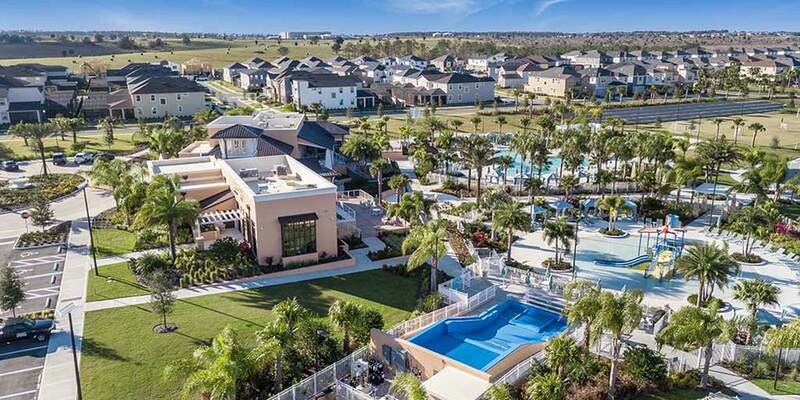 guard gated community, is located just 8 miles from Disney and within a short drive to Universal Studio and Volcano Bay, Disney Springs and numerous nearby beaches. You will also find that you are very near to shopping as well as many restaurants. An 8 acre clubhouse will be at the heart of Solara Resort and will incorporate many amenities that will bring many happy memories to you and your guests. These are to include a Two Story, 13,000 sq. ft. Clubhouse, Children’s Splash Pad and Interactive Water Slide, Restaurant & Bars, FlowRider Surf & Wake Simulator, Teen Hangout Zone, Fitness Center and much more.